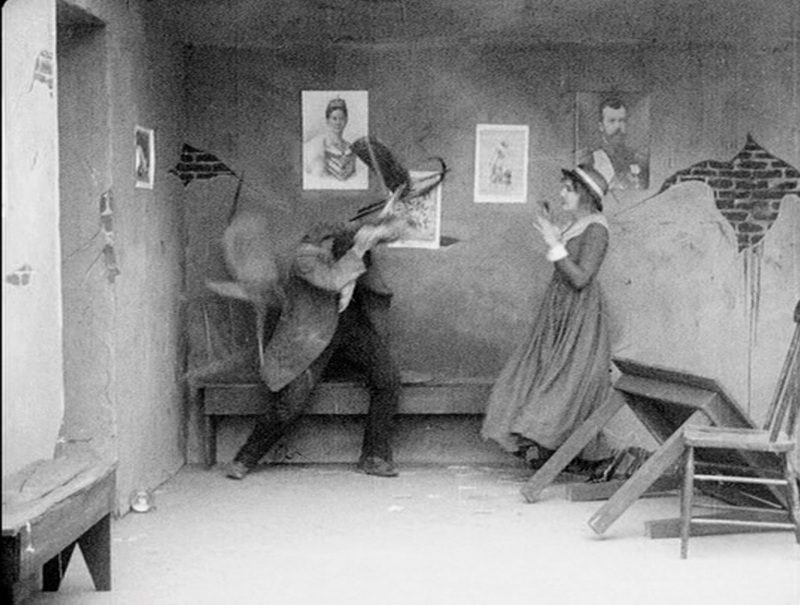 Charlie Chaplin’s first movie in 1917 has some surprising elements, including a reversal of his usual relationship to authority. Reflecting his improving budgets and extended production time, he built an entire street on a sound stage and used it to considerable effect. 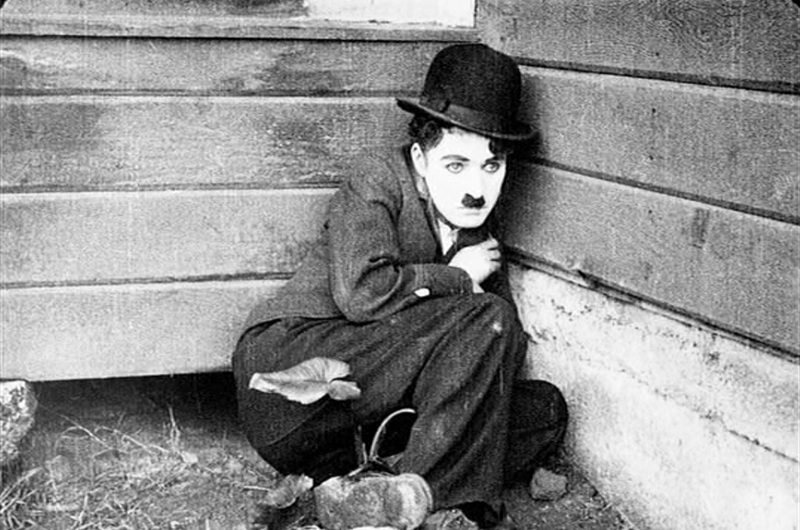 The movie begins similarly to “The Champion” and other familiar shorts, with Chaplin as the Little Tramp sleeping in the streets. He awakes to the lovely tones of Edna Purviance leading the choir at the Hope Mission, and ventures inside. The gags in the early part of the film involve sounds that the audience imagines but can’t hear – Edna’s singing, Charlie laughing during the pastor’s sermon, a neighboring parishioner trying to get Charlie to sing along with the choir, etc. 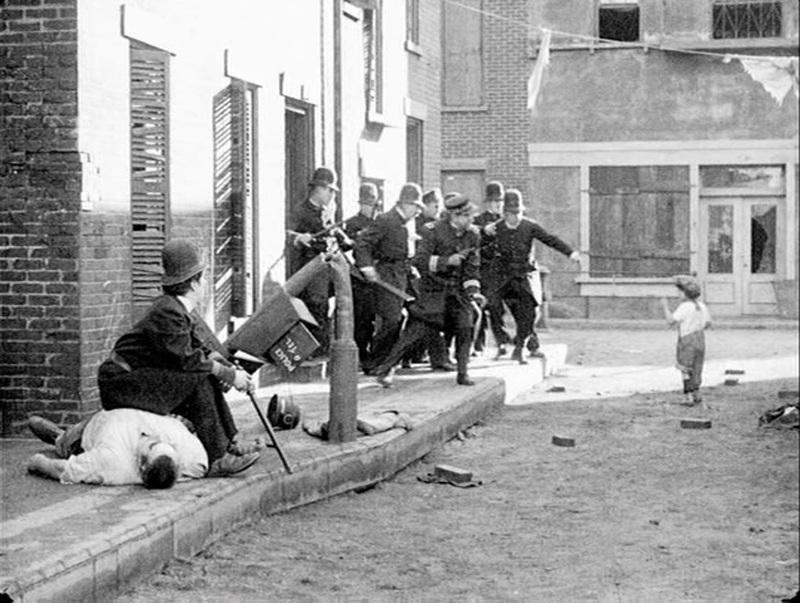 Then there’s an extended bit in which Chaplin agrees to hold a baby for another parishioner, and accidentally spills the milk from its bottle onto his pants – but thinks that the baby has wet itself (and him), and tries to foist the fouled brat back onto its mother. Rather a vulgar joke for 1916! Anyway, the real plot of the film gets started once the sermon is over. Charlie, and a rough fellow (John Rand) who also appears to be a tramp, remain behind when the other parishioners leave. Charlie wants to talk to Edna, but the other tramp tries to steal the collection box! Charlie recovers it and returns it, and Edna encourages him to “reform” and get a job. Now that he has experience catching crooks, Charlie thinks it would be a good idea to join the police force. Although it goes against his nature, he convinces himself to go into the police station and apply. Now the action shifts to “Easy Street,” which appears to be the site of an eternal riot. 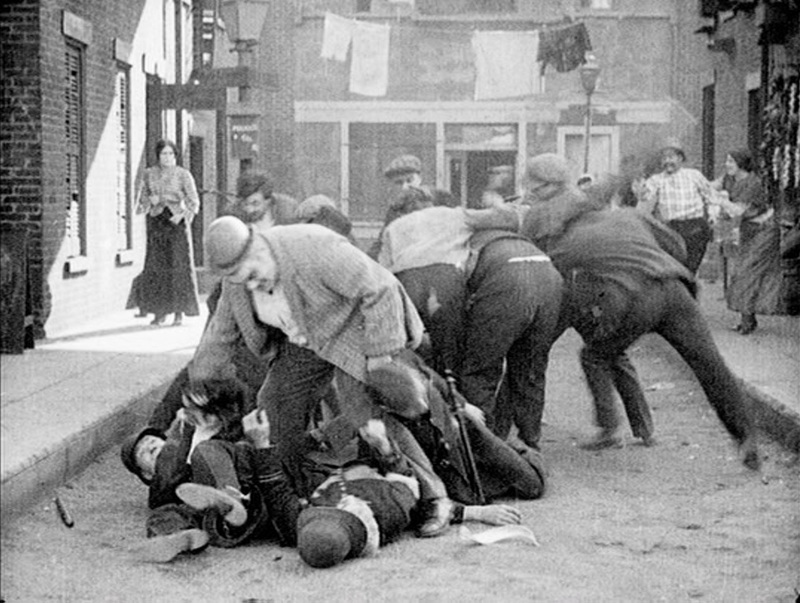 Working-class ruffians are beating the stuffing out of the few police officers brave enough to go there, and we see them returned to the station on stretchers, their uniforms torn and shredded. Eric Campbell intimidates other rioters and controls the street as a bully, wearing his spoils – a policeman’s cap. Charlie is informed that Easy Street will be his beat, but he has no idea what he’s in for. Just another day on Easy Street. When Charlie arrives at Easy Street, the riot is over, or at least there’s a lull. Debris is strewn in the street, but things appear to be quiet. The camera tracks towards him as Campbell stalks up behind, still wearing the policeman’s cap. Charlie, finally realizing he’s in danger, sidles up to a lamppost that has a police emergency phone on it. Each time he tries to move for the phone, Eric growls at him and he panics, dropping it. Finally, he tricks Eric into looking into the receiver, giving him a chance to bop him on the head with his billy club. Eric doesn’t appear to notice, so Charlie hits him again. And again. Finally, Eric turns around and sees that he’s being hit, so Charlie tries hitting harder, but with no effect. Eric flexes his muscles and grabs the top of the lamppost, bending it down. Thinking fast, Charlie pulls the lamp over Eric’s head, turning up the gas. Eric slumps into unconsciousness, and Charlie uses the still-working phone to call for backup to arrest him. The police are very afraid to come to Easy Street, even in a large group, and when a small child points his finger at them and goes “bang!” they all skitter in fear. 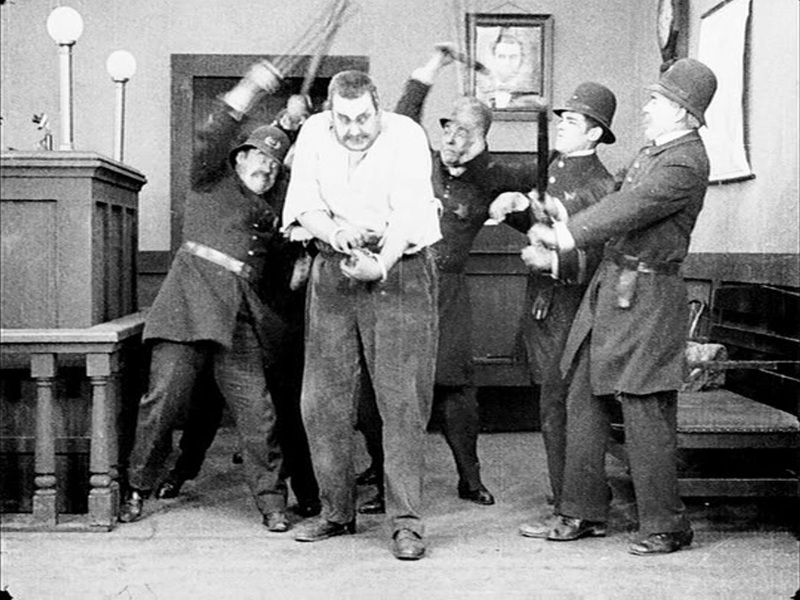 Finally, they drag the unconscious brute back to the station and cuff him. Charlie lights up a cigarette and starts a gas fire on the ruined lamppost. With things now peaceful on Easy Street, Charlie returns to walking his beat. He sees an emaciated woman (Charlotte Mineau) with a bundle hidden under her blouse. He confronts her and sees the food she has stolen. Feeling sympathetic, he goes across the street to where a fruit vendor snoozes peacefully, and steals more food for her, loading her up with ill-gotten gains. Now Edna walks up and sees Charlie 1) employed and 2) performing an act of charity (she doesn’t know the food is stolen). The grateful waif collapses from hunger and the weight of the food, so Charlie and Edna help her up the stairs to her apartment. Then Charlie escorts Edna to another apartment, which she is visiting on her missionary rounds. Meanwhile, Eric Campbell breaks out of the handcuffs. All of the policemen conk him on the head with their bully clubs simultaneously, repeatedly, but it does no good. He defeats them and escapes. He returns home – to his wife Charlotte! They quickly start fighting, with Charlotte throwing various pieces of crockery at Campbell, but with his great strength he gets the upper hand. One of the thrown items breaks the window of the apartment across the street, hitting the father of the family Edna is visiting, and Charlie goes back to Charlotte’s apartment to investigate. When Eric sees him, a chase begins. While this goes on, various lowlifes nab Edna and drag her to an underground lair. Charlie finally overcomes Eric by running back to the apartment and dropping a heavy iron stove from the window onto Eric’s head. Now, the ruffians grab him as well. Meanwhile, Edna is being menaced by a man who uses a hypodermic needle before becoming amorous/threatening. Charlie is dropped into the same room through a manhole and accidentally sits on the needle. Suddenly, he becomes a determined fighter, knocking out the addict and taking on several toughs from the speakeasy next door. He rescues Edna and brings peace and order to Easy Street. 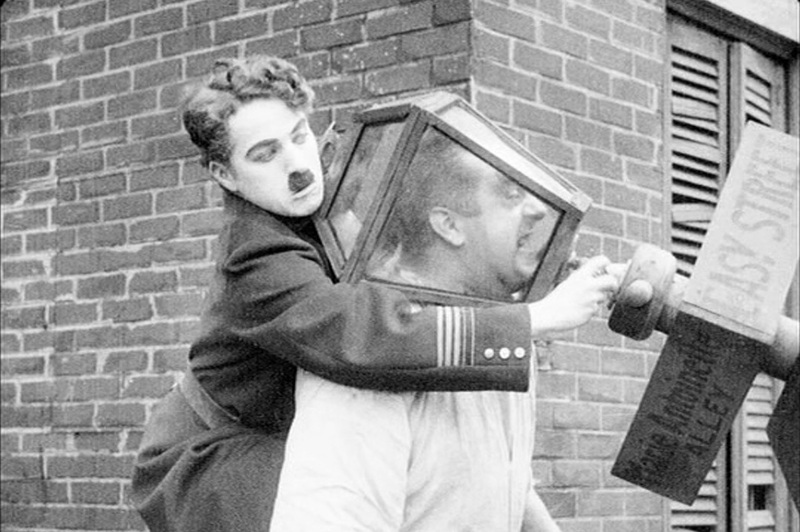 I don’t know for sure why Chaplin chose to do this, but it definitely works. 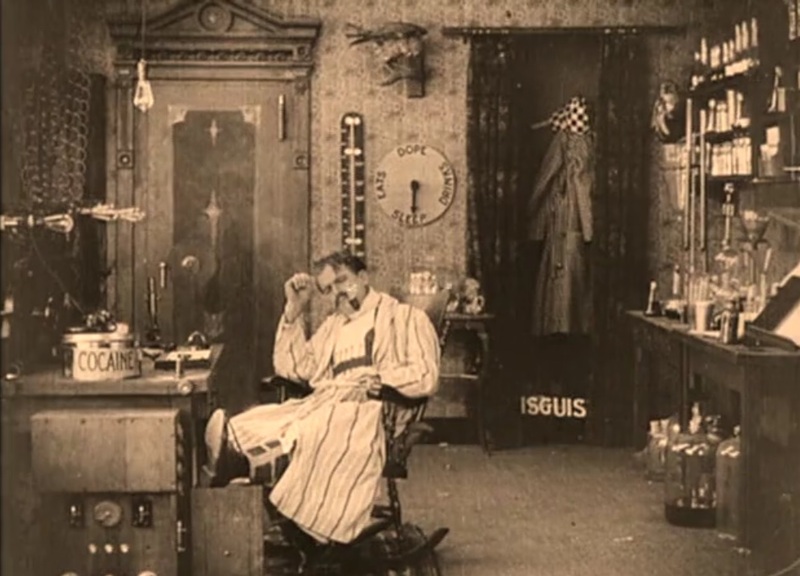 Many sources refer to this as the funniest of the comedies he made for Mutual, or even his funniest short, period. There are others I like better, including “The Cure,” “The Vagabond,” and the restored version of “Police,” but this is a contender. The street set is great, and evokes a kind of generic image of urban squalor, that could as easily be New York, LA, or London. When Eric chases him, we do get some very explicit exteriors of Los Angeles, which kind of ruins the illusion for me, but if you ignore that it’s a great location. 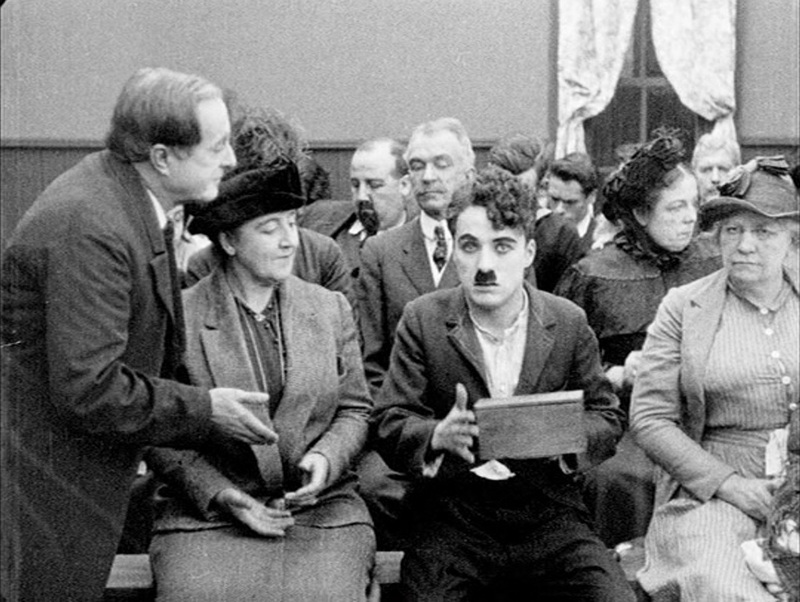 Chaplin uses all the tricks of cinema he has learned, including a mobile camera, close-ups, and cross-cutting, but it’s still his body language that sells the narrative. He uses his full body to give shrugs and express sympathy, his face lights up when he sees Edna, and he does his patented one-foot turn-hop during the chase sequences. 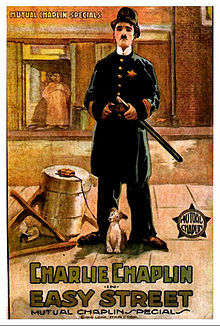 He repeatedly sends up the Keystone Kops, both in his own performance and his use of the other policemen. When he’s hopped up from the hypodermic, he uses his full body to fight, throwing his feet at crowds of opponents, and seems to be a dynamo of energy. The movie once again shows his talent for slapstick, as well as a newly increased confidence as a filmmaker.